It’s not just Ohio State that has the Midwest on the up and up these days. 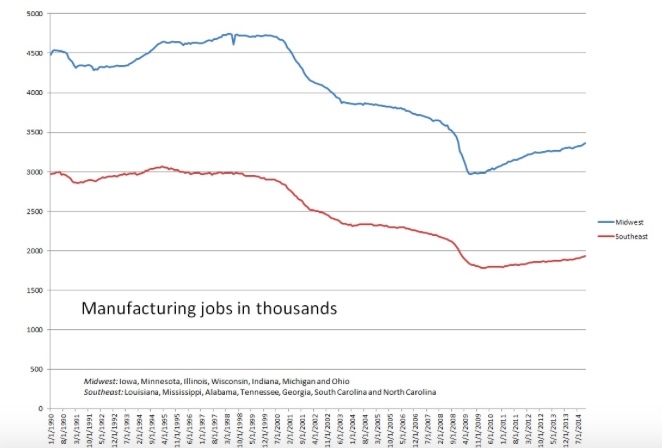 When you look at the numbers starting off the new year on manufacturing jobs, they show that the Midwest is outperforming the Southeast, and by a pretty healthy margin. In the past five years, the Midwest (Iowa, Minnesota, Illinois, Wisconsin, Indiana, Michigan and Ohio) has outpaced the Southeast (Louisiana, Mississippi, Alabama, Tennessee, Georgia, South Carolina and North Carolina), and has even widened the gap between the two regions when it comes to manufacturing jobs. ‹ VIDEO: The latest USMTO report, and what can manufacturers expect in 2015?